She was small and fuzzy and fit on my hand and forearm. I had passed her by on my first trip through the line of chain link and concrete paddocks because she did not respond. When I came back she was different… like she had known me for years beyond her short, eight-week life span. Yellow-lab features with golden-retriever tones, a mix she was, wiggling and dancing around the kennel floor. She was perfect, just the right breed, just the right time, just the right dog for the first of what would be seven grandchildren. I took her home. At that time in history news reports were running about a small boy in Florida, Elian Gonzales, with protests, and international discourse and federal officers with guns drawn flickering from TV screens. U.S. Attorney General Janet Reno stood before microphones and cameras and proclaimed the need to send the boy back to Cuba. I scratched my head and dubbed the little dog with the moniker of newsy lady. So, Janet Reno became a friend, a companion and a nanny for one grandchild, then another, then five more as the years rolled along – the dog, not the lady. We had had other celebrities as pets in the past. Olivia Newton John was an Australian shepherd that rode in my jeep and braved the jeep trails of eastern California’s mountains and deserts. Then came William F. Buckley. Buck was a rottweiler-husky who did the same in his term as family protector. She took her job as nanny seriously. She licked faces and chased tennis balls and guarded and loved and served as a TV watching pillow through countless episodes of Sponge Bob and Peppa Pig. She greeted her brood at the door and moped when they would go. She cheered and brightened our lives for fourteen years. Friendships between canines and humans are abundant in history, but dogs are here for a short time. Her coat turned gray, eyes grew tired, her zest for chasing and fetching and kid-watching waned. She slipped into family lore one morning at 9:30. Another paragraph of our lives had ended. Another story was told. I cried. We buried her in back where her kids still play, near the ball-chasing spot across from the swing. On that point in the yard, when the spring rains make their run to the ocean, a batch of golden-yellow flowers brighten the yard as giggles and laughter echo around the house and walk and trees. I don’t know if all dogs go to heaven, but they create a little a heaven while they’re here. 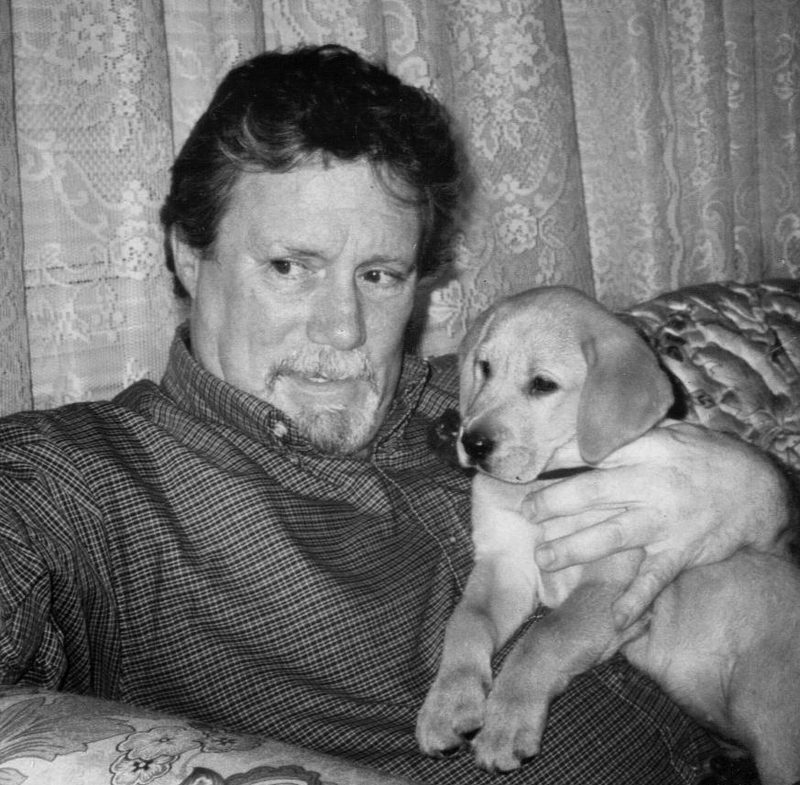 Reno and me, April, 2000. Finding beauty in brokenness can be a blessing of the mind and spirit. In these images the refractive qualities of glass and light interact to evoke one’s vision of whimsy or conversely reveal one’s demons. I was surprised at some of my own interpretations… more demons than expected buffered by substantial whimsy. 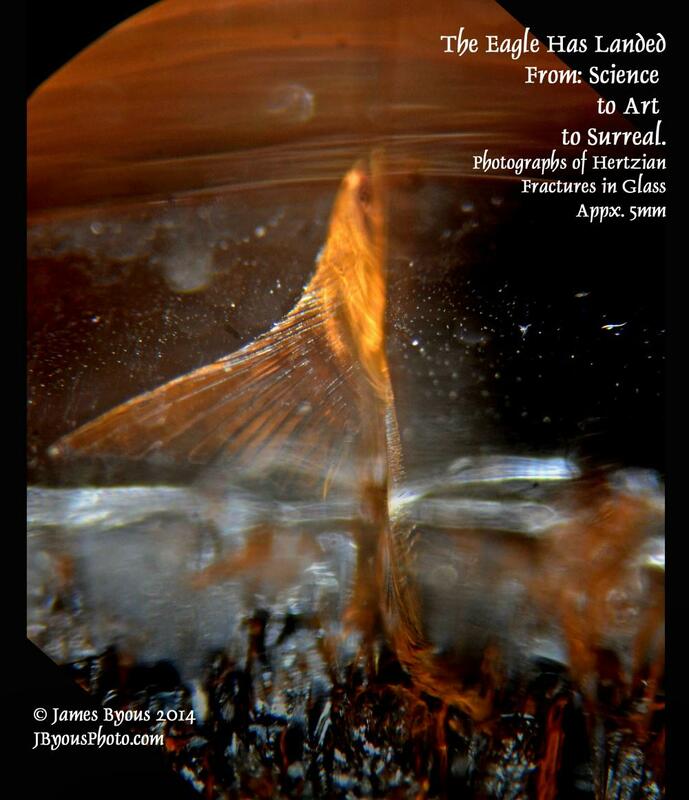 Some included here are studio portraits of the small one-half-inch-in-diameter glass cones. They emphasize the shapes and beauty-of-form in an attempt to transcend sterile science photos that grace the endless pages of academic journals. Many photos may have hidden features. Some do not. The viewer creates his or her own vision, so look closely. Other images reveal surreal extensions of the viewer’s mind where shapes are interpreted and features created from personal experiences, beliefs, fears and wishes. The image, “Watchers of the Fire” is interpreted by some as adventurers around a camp fire. Others see the same shapes as demons watching the fires of Hell. You may find another personal interpretation. I discovered these images while revisiting a photographic record created and compiled during nine years of laboratory studies on the physicalities of Hertzian fractures. By cropping closer, hidden and surreal images were highlighted in many of the photos. 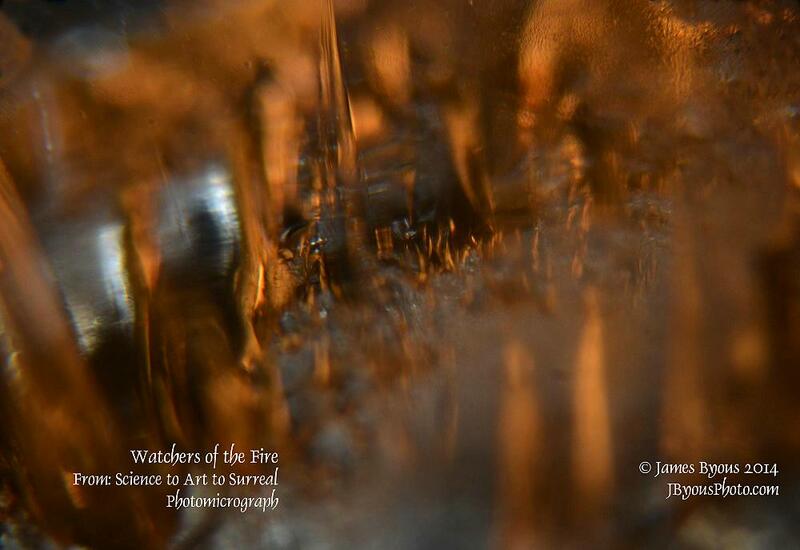 Watchers of the Fire, photomicrograph of Hertzian cone in plate glass. Height of area about 1mm. 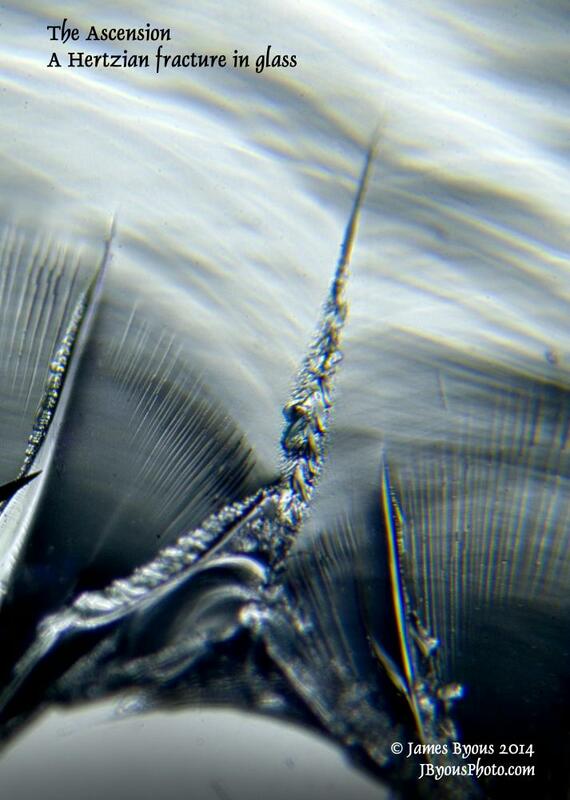 The Ascension, photomicrograph of Hertzian Cone. Width of area about 1 mm. To some the glow of the moon inspires. A glowing sunset beckons along the beach then fades slowly into the night. So starts my obsession to find the holey grail – the perfect doughnut. Not just glazed, or sprinkled or custard filled, but the best. For me it’s the neon moon – the yellow-orange, heart-stopping-full-of-love-and-warmth beacon that cries “HOT NOW” wrapped around those savory words, “Krispy Kreme”. THE electric moon. The siren song of pulsing neon. The lady of the evening calling, “Hey sailor!” – hanging, winking at the vulnerable passing by. It grips the lobes of the brain like the talon-gripped digits of a Yankee tourist on a Paula Deen pork chop. There are other kingdoms our city, Savannah, Georgia. Other vistas of white, sugar-glazed ridges… of golden brown islands floating in a sea of grease… of golden maple plains that crank a glucometer like a tac on a 450 supercharged engine. The best of the best… if there is such a thing to be found. 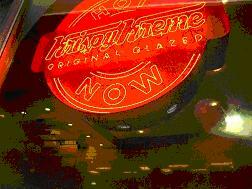 Yes, Krispy Kreme is king. Later in the evening with the after-glow of heartburn, a Tums or two comforts as I’m tucked into my warm bed, visions of floating circles in mirror-rippled grease. My grin is steadfast. I fade into peaceful slumber. But I awake… all a dream. Gluten intolerant. I cry myself to back to sleep. The siren sign. The solicitor of more pedestrians and drivers than… well… nevermind. Not long ago Becky (Rebecca Harrison Byous) and I had the opportunity to visit a friend here in Savannah who allowed us to view a family heirloom that has been passed down through four previous generations. It was a small leather-covered box about 12 inches by 9 inches by 4.5 inches deep. A small medallion highlighted the lid with an eagle and an inscription, “E Pluribus Unum.” The box served as a desk secretary for General Robert E. Lee and was carried by him through his early career and during the years he served and commanded troops during the War Between The States. It was a gift from his mother upon his graduation from West Point. I’d had the honor of viewing it once before late last year and was able to touch and handle it. But today it was an extra thrill for me to watch Georgia-girl, Becky as she was able to see, touch and feel history. For an Okie cowboy who grew up in history-sparse North-Central California, living here in Savannah has been exceptional and exciting experience… being the history nerd that I am. But watching others discover history is an equally fantastic event. Here, each footstep and conversation treads on and teaches of things historical. How cool is that? Recently I had the opportunity to glide around our beautiful city on a Segway tour from Segway of Savannah. Fantastic! After a short safety video three novices – two young ladies from Delaware and me – climbed aboard. Wobbly at first, it soon became second nature to glide, turn, stop and roll along the cobbled streets of Savannah. Our tour guide, Kathie, was knowledgeable on our city’s history and made the day enjoyable. Currently SoS is providing 1.5 hour tours of downtown along with a tour of Bonaventure Cemetery which is just outside of the Historic District. Talk is they will be adding other tours in the future after moving to their new location at West Boundary Street and Oglethorpe. If cotton was once king of the South, then the royal cradle was the sandy plot of land along Savannah’s eastern bluff called Trustees’ Garden. The role of the Garden changed over the years following the modes of history along the currents and courses that progressed from agriculture to industry to tourism. Events there helped form the face and destiny of Savannah, of Georgia and of the world. From the beginning silk was the desired product to be produced in Georgia. Modeled after London’s Chelsea Botanical Garden, silk production was the goal. Cotton was seemingly a second thought for the Trustees and to founder James Oglethorpe. Though the Garden fell into disuse after only a few years, the advancements achieved there were wide-sweeping. The short time when cotton plants were nurtured at the end of Broughton Street was an instrumental step in the development of a product that shaped the politics, the culture and the events of a growing region, nation and an eventual world power. The bluff at the Garden was more than an agricultural nursery. 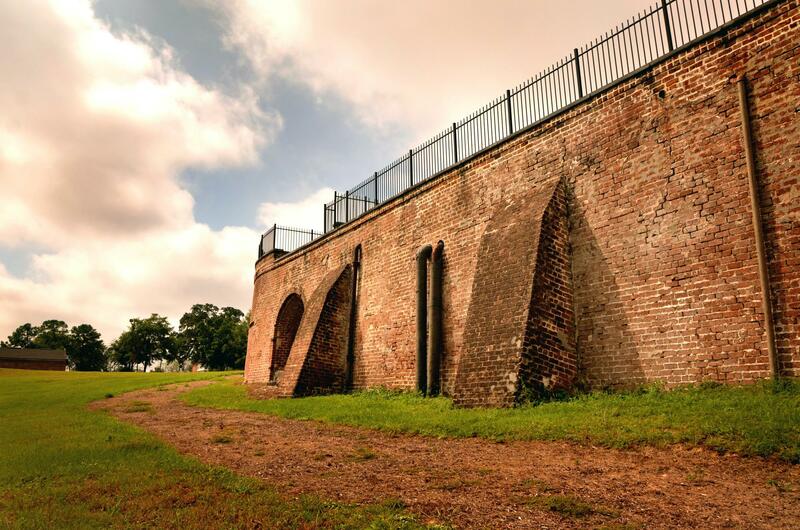 It was situated with a strategic military overview of the Savannah River. Multiple forts and cannon batteries occupied the spot that also served as an anchor spot for fortification walls that ringed and protected the city from advancing armies, real or projected. On a map entitled “Savanna Town” a diamond-buttressed fort just outside of the Garden area entitled “Castell” can be seen. A battery of cannon was located on the bluff of the Garden. The Gas Works wall at Trustees’ Garden is often mistaken as Old Fort Wayne because it stands on the same spot. Later in 1759 Fort Halifax occupied the bluff. The fort was named for the Earl of Halifax, the godfather of the second royal governor of the colony, Henry Ellis. This was an emblematic location during the days before the Revolution. Demonstrations against the Stamp Act by the newly named “Sons of Liberty” erupted in the city in December, 1765 when two hundred protesters mustered around the fort to destroy the loathed papers. Governor James Wright reported, “The Liberty Boys, as they call themselves, had assembled together to the Number of about 200 & were gathering fast and that Some of them had declared they were determined to go to the Fort & break open the Store & take out & destroy the Stamp’t Papers &c”. The Governor and fifty-four Rangers moved in to protect the stamps. When the crowd of protesters grew to three hundred Governor Wright spirited the stamps aboard the ship Speedwell that was docked at the base of the bluff. They were then taken to Cockspur Island and the protection of Fort George at the mouth of the Savannah River. Wright had reason to be concerned since the fort was in a state of disrepair from neglect over the years.